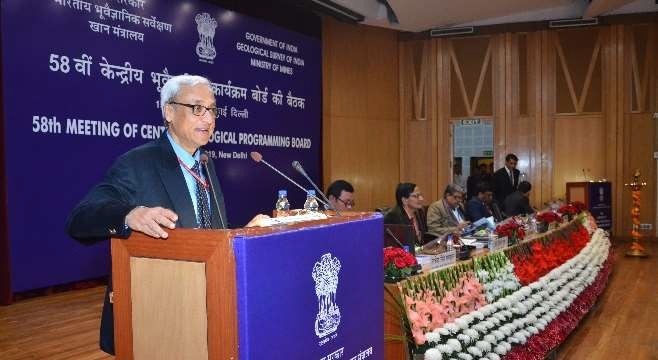 The 58th Meeting of the Central Geological Programming Board (CGPB) was held on 15 February 2019 at the National Agricultural Science Centre (NASC) Complex, Indian Council of Agriculture Research (ICAR), New Delhi. Shri Haribhai Parthibhai Chaudhary, Hon’ble Minister of State (Mines) graced the occasion as chief guest and inaugurated an exhibition displaying the status of “Mineral Exploration in India”. The meeting was held under the chairmanship of Shri Anil Mukim, IAS, Secretary to the Govt. of India, Ministry of Mines (MoM). Dr. K. Rajeswara Rao, IAS, Additional Secretary, MoM, Dr. Dinesh Gupta, Director General, Geological Survey of India (GSI), Shri R S Garkhal, Additional Director General, GSI, Shri Bipul Pathak, IAS, Joint Secretary, MoM were the other dignitaries to grace the meeting of the Board. During the occasion, seven publications (five from GSI and one each from Neyveli Lignite Corporation and DMG, Chattishgarh) were released. Twenty Mineral Exploration reports worth Rupees seventy nine thousand five hundred sixty crore (INR) were handed over to the seven state governments viz., Odisha, Rajasthan, Madhya Pradesh, Haryana, Karnataka, Andhra Pradesh and Kerala. Representatives of State Departments, Central Ministries/ organizations, PSUs, academic institutes and private entrepreneurs attended the 58th CGPB meeting. Apart from discussion on achievements of GSI during the current operational year 2018-19, the proposed Annual Programme for ensuing 2019-20 was presented before all Board members. On occasion of CGPB, GSI announced the launch of freely downloadable base line data (geological, geochemical and geophysical) from its web portal from 1st March 2019 onwards. This dissemination of data follows the guidelines of Ministry of Defense (MoD). GSI has also launched the 2nd round of multi-sensor National Aero-geophysical data acquisition in four prioritized sectors within the Obvious Geological Potential (OGP) zone for search of mineral deposits. The data acquisition over the four blocks taken up in the first round is nearing completion, covering 6 lakh line kilometers in the states of Rajasthan, Gujrat, Madhya Pradesh, Uttar Pradesh, Chattishgarh and Maharashtra. This data shall be available in the public domain by May, 2019. In view of the rapid depletion of surface/near-surface deposits, there is paradigm shift in thrust to probe deep-seated deposits under “Project Uncover”, in collaboration with Geoscience Australia in the Aravalli & Bundelkhand Cratons and Western & Eastern Dharwar Craton. Further, blocks have been prioritised for Deep Seismic Reflection (DSRS) and Magnetotelluric (MT) survey in collaboration with ONGC and IIT (ISM), Dhanbad. Fast track upgradation of exploration stages viz. G4 to G3 and G3 to G2 for various mineral commodities like manganese, vanadium, gold, base metal, PGE have been taken up by GSI as an additional measure to boost the GDP of India. GSI has identified mineralised zones for vanadium in Arunachal Pradesh, potash and phosphate rich zone in Jharkhand and REE in Rajasthan. Through its continual effort, GSI has augmented mineral resources worth Rs. 79,560 crores in the national exchequer during 2017-18. Projects are being implemented by various agencies with the support of National Mineral Exploration Trust (NMET) fund under the aegis of MoM to encourage participation of private entrepreneurs, both from India and abroad, especially for concealed and deep seated deposits. These steps will definitely help the mining industry to access relevant expertise for exploration that is expected to augment mineable resources. Besides fundamental research on intricate problems of geosciences, GSI is involved in several societal projects on landslides and earthquake hazard studies. Landslide Early Warning System in Giddapahar, Darjeeling and post disaster studies of Landslides in Kerala and Karnataka were taken up during the year. By March 2019, under National Landslide Susceptibility Mapping (NLSM) programme, 3.22 lakh km2 target area shall be completed. NLSM is aimed to complete the total target of 4.27 lakh km2 by 2020. Further, GSI has installed 20 nos. of permanent GPS stations in India to understand the crustal dynamics and providing high precision base station co-ordinates for other mapping activities. 10 broadband seismograph and accelerograph have been established for real time earthquake monitoring. As a measure towards capacity building and sharing of expertise, GSI has developed its unique outreach and collaborative programmes. MoU has been signed with IIT, Hyderabad (IIT-H) and IIT (ISM), Dhanbad that envisages capacity building and collaborative research leading to Ph.D. degree. MoU with Banaras Hindu University (BHU) is also being finalized. GSI has launched 100 x100 VAQ Model programme for enhancing Visibility, increasing Activities and enriching Quality of GSI activities. 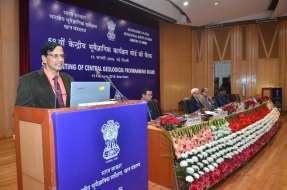 Bhuvisamvad, a unique platform under Ministry of Mines was launched, facilitating interaction of geoscientists from GSI with the students from different universities/colleges. Special awards in the names of eminent Geoscientists have also been announced. GSI has also signed MoU with National Council of Science Museums (NCSM), Ministry of Culture, Govt. of India for taking up the work for designing, development, fabrication, installation and commissioning of Gwalior Geoscience Museum at Gwalior in Madhya Pradesh. During the ensuing year 2019-20, GSI is taking up 897 regular Field Season Programmes which includes 390 programmes under mineral exploration to pave the way for downstream exploration activities. This almost doubles the last years’ record of 231 programmes (including 19 marine mineral exploration projects) showing a quantum jump in the field of mineral exploration activities in GSI. The 897 programmes comprise - 354 mineral explorations, 4 geothermal energy, 19 marine mineral exploration, 8 Regional Mineral Targeting (RMT) and 5 R&D programmes; 49 programmes on geoinformatics; 172 programmes on fundamental and multidisciplinary geoscience and 119 programs for training and capacity building for its own human resource as well as for the States and also for other organisations/countries. GSI is going to take up 93 programmes at the request of State Governments and SGPB/CGPB/VAQ recommendations, 6 programmes in collaboration with national institutes like ONGC, HSHDB, ISI, Kolkata, DTRL etc. and 3 programmes will be taken up with international collaborators like British Geological Survey (BGS) and Geoscience Australia (GA). 4 sponsored training courses will be taken up with ISRO and MEA and there will be 20 sponsored geotechnical projects with various stakeholders like NWDA, CWC, NTPC, Railways, NALCO etc. 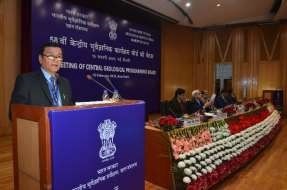 The finalization of programmes took into account the priorities and importance set forth by the Government of India through its various policy decisions and also on the basis of the recommendations of CGPB Committees’ and State Geological Programming Board (SGPB) meetings. As the nodal organization for 36th International Geological Congress (IGC), scheduled to be organized during 2-8 March, 2020, GSI is spearheading various preparatory activities viz., science, field trips, legacy programme etc. of the congress and has pivotal role in its organization. The congress is likely to attract more than 6000 international delegates and shall be having more than 40 parallel scientific sessions, 60 field trips across the Indian subcontinent. Known as Olympics of Geosciences, IGC is returning to Indian soil after a gap of 56 years.